Home Again was the show that linked the previous vaudevillian offerings with Broadway. It started as an updated version of Mr Green's Reception, written during the late summer of 1914 by the brothers's famous uncle Al Shean. It so happened that uncle Al gave Harpo only a couple of lines, which is why Harpo from now on became a mute on stage. It was also the show the Marxes stuck with the longest. It opened in September 1914 and they were still performing it four years later. No surviving scripts have been found but a storyline can be pieced together from the memories of Groucho, Harpo, the Marxian scriptwriter S.J. 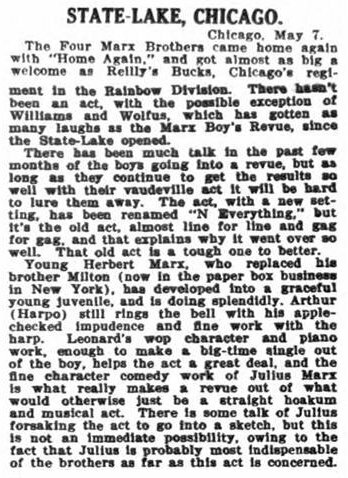 Perelman (who saw the show in 1916 as a twelve-year-old) and paper reviews. ...depicts the docks and piers (suggested by four battered satchels) of the Cunard Line in New York. A mass of people (c 15) get off the Britannic, with a sleazy backdrop representing the gangway. Groucho, with swallowtail coat, spectacles and unlit cigar and accompanied by a wife sporting a feather boa, is returning from a voyage across the ocean. The air is full of streamer, confetti and Groucho's jokes about seasickness; "Well friends, next time I cross the ocean, I'll take a train. I'm certainly glad to set my feet on terra firma. Now I know that when I eat something, I won't see it again." In Home Again the Marxes were still using some of the ethnic stereotypes that were so typical for vaudeville. "This must be the Far Rockaway boat", Groucho concludes. "How do you know?" his wife asks. "I can smell the herring", Groucho answers, twitching his nostrils. The explanation of this joke is that Far Rockaway had a large Jewish population and the herring is a fish associated with the Jewish diet. Groucho and his wife are accompanied by daughter Helen and the dapper but notably sassy son Harold, played by Gummo, carrying a cane, white gloves and white trousers (as Gummo informed us in The Marx Bros Scrapbook). While on the dock, Gummo heckled Groucho with sufficient frequency for him to remark: "Nowadays you don't know how much you know until your children grow up and tell you how much you don't know". A flirtatious young soprano (The Soubrette) was also on the boat and Gummo as the certified "love interest" had fallen for her charms. Groucho also showed his interest, much to the anger of his wife. Harpo and Chico show up among the crowd and start stealing lingerie off the female passengers. A cop comes on and explains that some of the ship's silverware is missing. "Being a full-time pantomimist now", Harpo wrote in his autobiography, "I worked hard thinking up stage business that didn't require spoken lines. I swiped a bulb-type horn off a taxicab and stuck it under my belt before going on in Home Again. When Chico and I started our fight and the cop clomped on and yanked me off Chico, the horn went whonk! and we got a hell of a big new laugh." The cop accuses Harpo for the thefts but finally decides he's innocent. He shakes his right hand and the silver drops from Harpo's left sleeve. Some sources place this gag in the second scene at the party with Harpo confronted by a detective. The gag may have shifted scene during the long run of the show but it could also have occurred twice, both at the dockside and at the party. Groucho tells everybody on the dock to be sure to come to his party. Chico offers the hand of friendship, adding "I'd-a like to say goombye to your wife". "Who wouldn't?" Groucho answered. Some sources say that Groucho initially still appeared as Mr Green in the show, but pretty soon he was renamed Henry Schneider. Similarly, Harpo may have continued to play Patsy Brannigan but was soon billed as The Nondescript, dressed in striped shirt, torn raincoat, battered hat and red fright wig. After the sinking of Lusitania on 7 May 1915, all German allusions disappeared over night and thus Groucho's character became Henry Jones. He was Henry Hammer when the show was renamed N'Everything in February 1919. The surname Hammer was kept in On The Balcony and in the film version of The Cocoanuts in 1929 (although that character was called Henry W. Schlemmer in the play). Groucho's wife in Home Again always appeared without first name, although the above mentioned memories of British comedian Sandy Powell suggests that she bore the familiar name Minnie. According to Perelman, Chico appeared as Leo the Wop although most sources name him Toni Saroni. This can be compared with his persona in the stage version of The Cocoanuts, Willie the Wop, and his character Chico Saroni in On The Balcony. In October 1918, the Marx Brothers felt ready to move further in their career but when the new show Street Cinderella became a flop they revived Home Again under the name The Four Marx Brothers Revue. It opened on 7 February 1919 but was quickly renamed N'Everything and ran to December 1920. It's storyline about the attempts of a newly rich family to break into society clearly echoed Home Again. The title Back Home has also been mentioned as a version of the show. Gummo went into the army in October 1918, eleven days before the Armistice, and Zeppo replaced him. This was probably during the last performances of Street Cinderella or in The Four Marx Brothers Revue. Zeppo had joined the act briefly in September 1915, making this the only sketch ever to have employed five Marx Brothers. In The Marx Bros. Scrapbook, Zeppo says: "I never did care about show business. But my mother called me up to tell me that Gummo was leaving for the army and that she wanted to keep the name THE FOUR MARX BROS. intact. She insisted I join the act and that's what I did." ...takes place two (in some versions three) weeks later. The backdrop is lifted to reveal the full stage, ostensibly the lawn at Groucho's villa overlooking the Hudson River. To set the scene, Gummo sings the song Villa on the Hudson. Groucho was now wearing a plaid-trimmed smoking jacket while his brothers and the other male guests wore tuxedos. Much of the second act consists of various performances, introduced by a Master of Ceremonies (initially played by Paul Yale of Fun In Hi Skule-fame). Harpo is introduced at the party by the "garbage man-joke" from Mr Green's Reception and when entering with Chico, they start climbing over couches to sit in ladies' laps and guzzling the water out of the goldfish bowl and then swallow the goldfish. Another theft provided Harpo with an excuse to search two of the girls. Eventually Groucho gets tired of being annoyed by these two rambunctious guests, and when they start chasing a girl around the room he gives up and joins them. The major role of the fourth Marx brother (whether it was Gummo or Zeppo) was always to sing and dance. When Columbus Daily Dispatch wrote about the show on 1 October 1916, they especially mentioned "Milton and the athletic Billie de Rex in a whirlwind dance which the harpist finishes, dragging her off in the most approved male vampire fashion". At the end of the show, the young people all get into a papier-mâché boat mounted on wheels. They move off the stage with a rousing chorus. All the lights except on the deck go out while the boat is seen going down the river in the distance. Harpo usually added a gag in the end, like tugging on a rope and sending the passengers tumbling, or some business of missing the boat and pretending to swim after it while spewing water. British comedian Sandy Powell was on the same bill as the Marx Brothers on their British tour 1922. When interviewed by Peter Dixon in The Freedonia Gazette, Winter issue 1981, Powell remembered the last line of Home Again; "They all said goodnight to each other and then Groucho said, 'Minnie, they've gone, get the supper ready'. I can remember that so well.". Powell also said that after the obvious finale, Groucho used to step forward and say: "Ladies and Gentlemen, that concludes our performance", which always made a laugh. ...of Home Again kept changing like the show itself. Gummo's number Villa on the Hudson has already been mentioned and when George Lee left the show after a conflict over his salary, Groucho took over his contribution by singing the contemporary hits Get Out and Get Under, Won't You Be My Little Bumblebee and Somebody's Coming to My House. Harpo and Chico always had a "Harp Specialty" and "Piano Specialty" in the show. When Perelman watched the show in 1916, Harpo played The World is Waiting For the Sunrise while Chico offered Chopsticks. On the strength of some compositions by Chico, Home Again was presented with "Musical Numbers written by the Four Marx Bros". Do Not Say Good-Bye, copyrighted in 1915, had words and music by Chico and was sung by one of the male vocalist in the troupe. Walking Thru Lovers Lane, written by Chico with musical assistance by Harry De Costa, was also published at the time but is absent from the 1915 bill and may have been a later addition to the show. The cover of the sheet music also mentions another song by De Costa, The Little Grey Mother Who Waits All Alone. Sailin' Away on the Henry Clay was published in 1917 and the fact that this song had lyrics by Gus Kahn and music by Egbert van Alstyne suggests that it may have been written for Street Cinderella and salvaged from that flop when Home Again was revived. There may also be a connection with Al Jolson's 1918-show Sinbad, which contained songs by Gus Kahn, including a tune named 'n Everything (and, incidentally, the tune I'll Say She Does, see My name is Sammy Brown...). A billing for the Orpheum Theatre in Oakland, California, for October 1915 (reprinted in The Marx Bros. Scrapbook) details Sweet Kentucky Lady (with words by Wm. Jerome and music by Louis A. Hirsch) as the finale. Later this song was replaced by The Way to Waikiki and when Perelman watched the show in 1916, the finale was Over the Alpine Mountains E'er So Far Away, segued into Franz von Suppe's Light Cavalry Overture. During the British tour in 1922, the Marx Brothers returned to Home Again for the last time when On The Balcony failed to attract the British audience. Like its predecessors Fun In Hi Skule and Mr Green's Reception, Home Again was never filmed but these shows set the Marxonian standards and echoes of them were noticeable throughout their careers. For example, by watching Horse Feathers and Monkey Business as a double-feature, we'll see the Marx Brothers having "fun in Huxley hi skule" before leaving on an ocean trip and turning up at "Mr. Helton's Reception" when they're back "Home Again".